It's the first Monday of the month, which means it's the start of a new challenge at the Path of Positivity Challenge blog. This month's theme is 'Opportunity'. After thinking about this theme, and how I most appreciate using opportunities to share of myself, it seems I'm usually lacking in time to do what I'd really like to do. Work gets in the way. Family and commitments get in the way. Yes, even crafting gets in the way. Time is a gift, an opportunity to share it how ever we choose. Choose wisely! I used the pre-printed image, printing it twice, adding the sentiment to the bottom layer. I fussy cut one layer, using foam tape to add dimension. 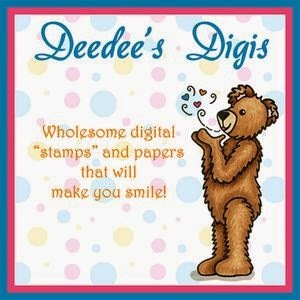 The designer papers are from Lisa Decosse, of Decosse's Dynamite Doodles. This set of papers is called "Christmas Time", but I thought it worked well for this time-themed card. I cut the card base out on my Cricut, and wrapped some Timeless Twine around it. When you think of the word 'opportunity', what comes to mind for you? Design a project around those thoughts, and link up this month at Path of Positivity. We've got great sponsors, and I'd love to see what you make! Yes, time is truly a gift. I'm happy I had the time to come be inspired by your creations this morning. I always love a day that starts with coffee and Julie O creations! This is fabulous my friend.